If you’ve heard the buzz about the three-room apartment in the sky complete with personal butler The Residence you’ve gotten a little taste of how Etihad is pushing the limits of what travelers expect from their airline. That difference also extends to its reward program, Etihad Guest, which includes many of the familiar perks you enjoy in other programs, such as Miles+Cash awards and no blackout dates, along with some innovations, like the ability to cash out your miles directly into money if you so choose. Etihad’s excellent products and service have earned it the title of “World’s Leading Airline” at the World Travel Awards every year since 2009. If you’d rather fly with another carrier, though, you can use Etihad Guest Miles on a host of other airlines. Even though Etihad is not a member of a major airline alliance, they are building their own partner network, which currently includes reciprocal points earning and redeeming, along with other benefits, on 23 carriers. You can also get codeshare flights with 18 other airlines. If youre looking to expand your miles options beyond the three main worldwide alliances, Etihad is a great place to start. Even if you’re new to the mileage game, but want to stick with an airline that is strong on service, perks and luxury, Etihad might be the airline for you. 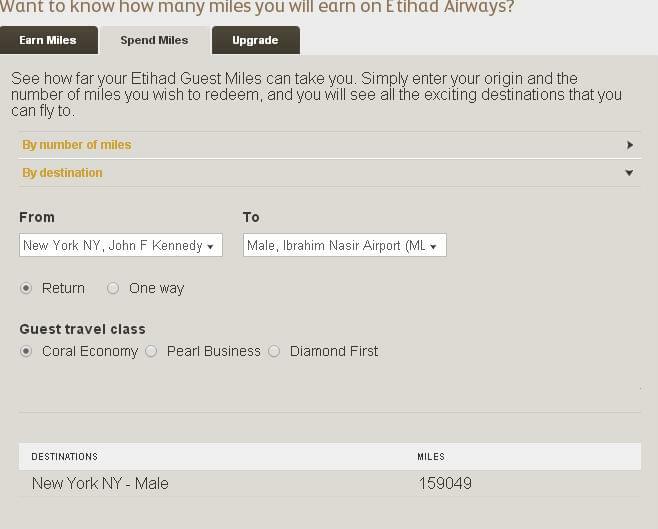 How Can You Use Etihad Guest Miles? Etihad gives you a number of ways to use your miles, from the usual flights and upgrades to Miles+Cash fares, in-store shopping, on-board upgrades and paying for extra baggage. You can use your miles to book a seat on any flight, which can be great for business travelers. The privilege comes at a cost, though, with JFK to Abu Dhabi flights beginning at 60,111 miles at the lowest tier and reaching 152,667 for the most expensive fare bucket. However, you’ll only pay additional fees of around $7 for flights from the U.S. and $40 for flights from Abu Dhabi. So, in a sense, the high redemptions are balanced out. 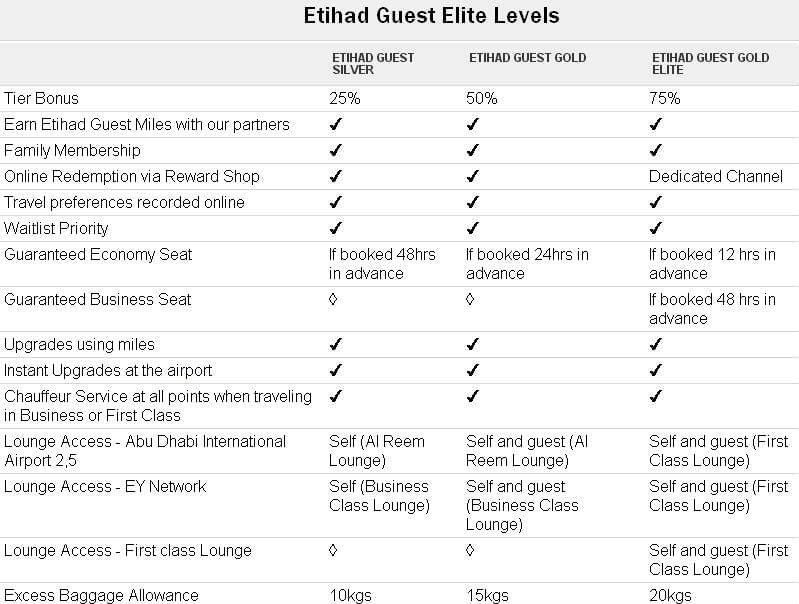 Like fellow Emirati airline Emirates, Etihad makes a lot of things easy for frequent flyers, but pricing awards is not necessarily one of them. To determine how many miles you’ll need for an award flight, Miles+Cash booking or an upgrade, you’ll need to poke around the mileage calculator. Award ticket rates, even in the lowest fare bucket, are quite steep compared to the competition. It costs 159,049 miles to fly from the U.S. to the Maldives roundtrip in economy versus just 90,000 miles on partner American, through which you can book the exact same flight on Emirates. You can save quite a few miles without spending too much money using the Miles+Cash feature, which only requires 75 percent of the total miles for the route, with the rest in cash at a rate of .9 cents per mile. Youll still earn miles on your fare this way, which is extremely valuable on long-haul routes, particularly in upper classes: think 45,110 for a round-trip, first-class flight from the Chicago to the Seychelles. As Etihad has relatively high award redemption rates across its network, but no additional cash payment on upgrades, the best way to use your miles is to upgrade a low-end cash ticket to a better class. To fly to Abu Dhabi from JFK, you’ll find tickets starting at $1,068 roundtrip in coach, and $10,170 in business. But, to upgrade to business using miles, you’ll only have to pay 53,000 each way that’s about $1,060 roundtrip, if you peg miles at one cent per mile. Thats a savings of more than $8,000! As Etihad awards come at quite a premium compared to other airlines, you’re really burning miles for no reason when you book extremely expensive upper class fares with just Etihad miles, rather than as upgrades or through another airline. That same U.S.-to-Maldives flight we looked at earlier may seem expensive to book in coach for nearly twice the miles, but when you book it in first class via Etihad, you’ll shell out nearly 300,000 miles rather than 180,000 through American. Upgrades with miles are easily available on Etihad flights, regardless of the fare class in which you originally booked. Most awards may be on the high side compared to other airlines, with JFK to Abu Dhabi beginning at 53,000 one way to upgrade, but there are no cash payments in addition to the miles charged. For comparison, you only need 12,500 miles to upgrade from London to Mumbai on Virgin Atlantic, but there are several hundred dollars of fees as well. There are no Etihad co-branded credit cards currently available in the U.S., but the program offers the Etihad Guest Credit Card through MBNA to program members in the U.K. The card comes in American Express and Visa options, with the former earning 1.5 miles per pound and the later 1.5 miles per two pounds. Both cards carry a bonus of 5,000 miles after spending £250 within the first 90 days after opening the account, and offer fast tracked silver status after your first round-trip flight.